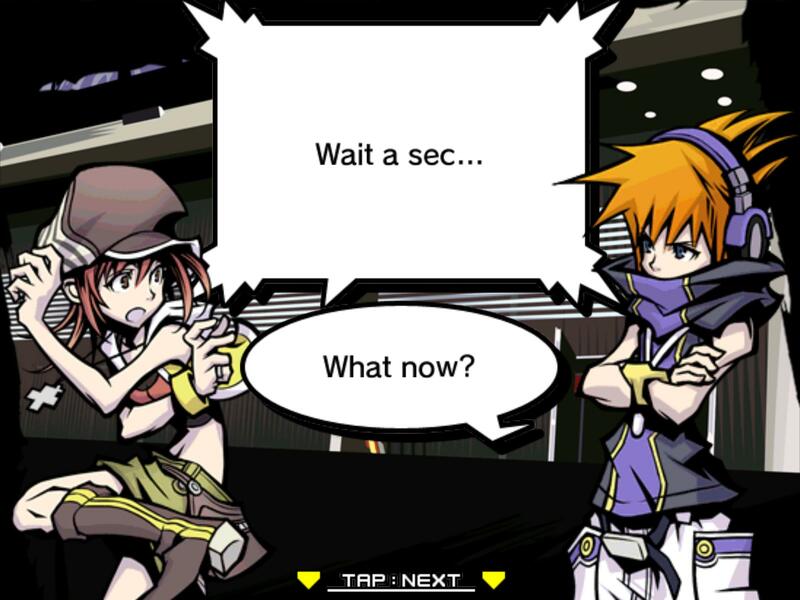 Last night, at 11pm EST, The World Ends With You was released for iPad and iOS. I found out about the release yesterday morning. For a week there was a teaser site up with a countdown (which plays a major role in the game itself), and there was rife speculation: could a long-awaited sequel be in the works? The teaser countdown. Image via gamefans. Now we know that the countdown was for an iOS port. SquareEnix has gotten flack for overhyping and the high prices ($17.99 and $19.99). But no one complaining seems to have played the game, and thinks that because it is on iOS, it must therefore be horrible. Apparently they’re forgetting that getting to play an amazing game is a privilege, not a right. It’s the same as George Lucas changing Star Wars: he created it. Just because you have fond memories doesn’t give you any ownership. More importantly, they’re also forgetting that the controls in the original were good, but not great. The DS’s touchscreen sensitivity greatly impeded certain gestures, so much so that I actually ignored certain pins and abilities based on which gestures they required. For example, it was nearly impossible to get any of the “throw objects” pins to work right, because the game would always think you were tapping or swiping at an enemy instead. The dual screen mode was dynamic, and difficult to control. 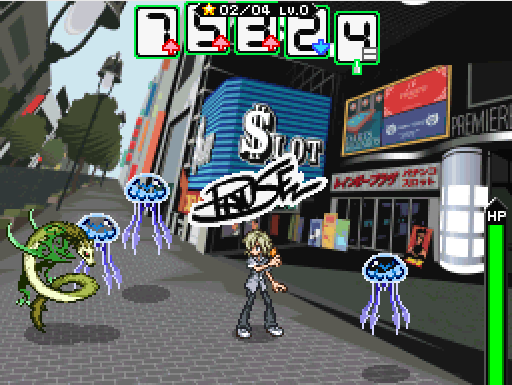 I remember ignoring the card system (not the combo system) almost completely, and just worrying about coordinating attacks with the lower screen. My girlfriend, who actually introduced the game to me, has said that she, for the most part, completely ignored the upper screen. See those cards at the top? Yep, totally ignored them. The battle system was an experiment, and one that was successful. Players could ignore the top completely if they wanted, because the point of the game was not to train you to be amazing at something you might not be (such as multitasking and viewing two screens at once). Instead, players were allowed to focus on where they personally found fun in the game. Perhaps you hated the battles, but liked collecting new equipment? 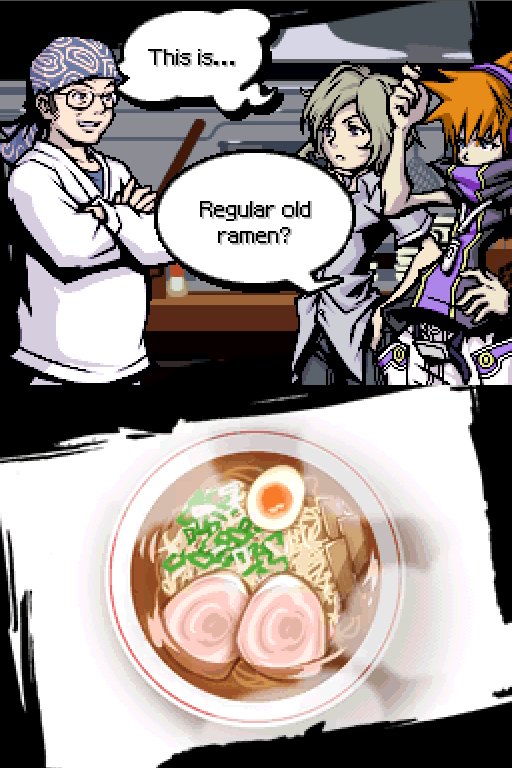 What about just discovering new types of delicious-looking ramen? Anything but, Neku, anything but. And now we have an iOS port. Compared to a DS, iOS devices lack physical buttons. But their touchscreens are uncontested for responsiveness. This means that gestures actually work when you want them to! This gives you, the gamer, better tools to consume this tasty, tasty game. This “port” shouldn’t really be called that. It should actually be called a remake or adaptation. Sure, the menus are similar, the graphics have the same feel: it’s not like the cutscenes are suddenly 3D or something. But the developers didn’t just take a game and do the bare minimum to make it work on iOS, they remade it, seemingly by hand, for the new platform. This means changes to the actual game mechanics. Does anyone realize how difficult changing the core mechanics of a game is!? It’s not like you just take DS code, apply an iOS touch-translation layer and then ship. I do have two criticisms. All of the art, with the exception of pixel-based icons, have been redrawn, or at least resampled from the originals. However, there are always pixelated lines around everything, even fonts. Occasionally there are extremely straight, unpixelated lines. It’s not the worst thing in the world, but I find it distracting, especially when the original artwork is very likely vector-based to begin with. I’m playing on a retina iPad, so this may not be noticeable at all on the iPhone or iPad 2. Click to view at full size (required to see what I'm talking about). On a retina iPad, the inconsisten bitmapping leaves the fonts looking like victims of JPEG compression. My other criticism is what has been said by others: this should be a universal app, with optional cloud-saving to share games between my devices. I would have gladly paid $25 or even $30 to have the game on my phone and iPad. Phone for when I’m out and have some time to kill noise, and iPad for at home. As it stands now, the ~$40 to buy it for two devices just feels like a lot of money, even though it’s not when compared to a full price console or DS game. Bottom line: charge a bit more, and give me both. I’m only about an hour in, but man am I excited to continue!